Disclaimer: I am friends with the publisher of this book, Alisa Krasnostein. The first story, “Stalemate,” is probably the scariest, and that’s because it is the most mundane. Which is saying something, because three out of four of these stories are defined by being set in domestic settings (by which I mean only non-exotic, like another planet or a medieval castle). It’s a suburban kitchen, with a mum and her grown-up daughter, arguing over all the tired old things that parents and grown-up kids argue over, with the added bitterness that Mum is there to help the daughter while she is sick. Of course, it turns out that things aren’t quite as mundane as they seem – and this revelation makes things all the more awful because of the very setting, and the consequences. It’s terrible. My favourite story is “Thrall,” because it does the most clever things with the horror ideas it’s working with. It’s the story that is least obviously ‘domestic’, involving as it does a Hungarian castle; but even then, it opens in a dingy suburban cafe, and the castle is a tourist trap. Dragomir is a vampire, returned to Hungary to get a bit of rest. He has called a thrall to him – a woman whose ancestors pledged their allegiance to him many centuries before – to help him get ready. The narrative is fairly simple and straightforward. What really makes the story intriguing though is people’s reactions to Dragomir, and his reactions to them. 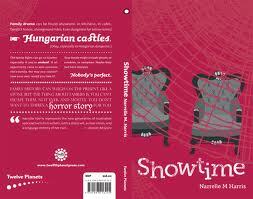 Harris has gone with a much more ‘realistic’ vampire, in that he is very much a man of his times – his original times. He is shorter than the average 21st century man. He despises much of the modern world. And, in return, much of it despises him, too. “The Truth about Brains” makes the reader into zombie territory, and the heady days of summer in the suburbs. Again the characters revolve around the family, this time an older sister impatient with her brother who, as the story opens, has kind-of sort-of accidentally been turned into a zombie. The narrative backtracks to explain how that happened, and then explores the consequences for the sister, the brother, and the other people involved. I think I found this the least convincing of the stories, mostly because the characters didn’t work for me. It could also be that I just don’t like zombie stories. The last story is the longest, and relates to Harris’ novel The Opposite of Life, which I’ve not read. “Showtime” involves Gary – a not-that-happy-with-it vampire – and his friend Lissa, a librarian, heading to the Melbourne Show, location of rides, craft, wood-chopping exhibitions… and a haunted house. Harris does well to bring those unfamiliar with this version of Melbourne up to speed, with crafty hints at Gary and Lissa’s shared past of dealing with less-than-friendly vampires, and how this friendship manages to exist at all. It captures some of Gary’s angst and rue at not being alive, and suggests an interesting take on the implications of being undead (sunlight isn’t deadly but more like a beta-blocker; he has no adrenaline so rollercoasters are pointless). However, in the end the story fell a bit flat for me, and I think that was partly because I wasn’t as invested as I could have been in the lives of Gary and his vampire brethren existing (as it were) in the shadows of Melbourne. Might have to buy it in Melbourne :), get the author to sign it. That would be sooo meta.